Haurex watches have not been around very long, but the Italian watchmaker has drawn a lot of attention for their bold, edgy designs. 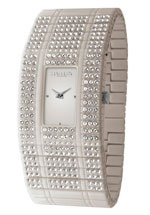 With exciting styles for both men and women, many of their watches feature oversized cases and bright, colorful looks. They’re rugged and attractive and not overly expensive, at least as far as luxury timepieces go. If you’re looking for a wristwatch that’s well made and sure to draw attention, you definitely want to give Haurex watches a look. 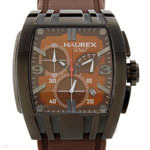 Read on for the full Haurex watches review. Huarex watches are made by the Gevril group, and as such, the build quality is good; they use stainless steel for their cases and mineral crystal to protect the watch face. Water resistance is good, with many models rated at 100 meters or more, though water resistance will vary by model, of course. A number of models have either shoulders or a bracket protecting the winding stem from being broken during use. While not the most rugged watches on the market, they are well built and should work well for years with proper care. Haurex watches feature Italian-made movements, which makes them somewhat rare in an industry that usually features movements from either Switzerland or Japan. While most of their models use highly reliable quartz electronic movements, a few models feature mechanical movements, including both automatic (self-winding) and manually wound models. We don’t see a lot of technical innovation in Haurex watches; they’re mostly about taking known technology and putting it to interesting use, rather than trying to create new technology. As these are relatively inexpensive timepieces, that’s not surprising. It’s unusual to find cutting-edge features in wristwatches that are priced in the hundreds of dollars. The styling is where the company really attracts attention. They make ample use of oversized cases, bright colors, and Swarovski crystals. 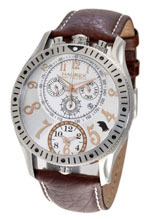 A number of their men’s models have industrial looks that are reminiscent of those from U-Boat watches, and models with chronograph features are quite common in the product line. Women’s models offer more in the way of design variation, with oddly shaped faces, bright colors, odd face layouts, and more. You’ll find a few models with sweep second hands and a date complication. You won’t find more elaborate complications, though, such as moon phases or reserve power indicators. They leave those for the companies that offer products at much higher price points. Despite the fact that these are mostly quartz watches, displays are all analog. These are fun, stylish watches that should attract attention wherever you go. Care and maintenance should be relatively trouble free, as most of their models use highly reliable quartz electronic movements. Those models will need to have their batteries replaced every two years or so and you should store them in a cool, dry place and away from extremes of temperature. Automatic models should be inspected every three to five years to ensure that they’re working correctly. If you have questions about servicing a mechanical model, we suggest that you contact the company regarding further instructions. With proper care, your watches should run well for years to come. The warranty is for two years from the date of purchase against defects in materials and workmanship. This is an adequate warranty and it’s more or less the industry standard. Probably nine out of ten watchmakers offer a warranty of two years. These watches are thoroughly tested at the factory prior to shipping, so you are unlikely to find one that’s defective. As luxury watches to, you’ll be surprised to find that prices are quite reasonable. They start at about $195 and we’ve seen models with suggested list prices of up to about $1500 or so. A few limited edition models are offered for sale from time to time and these may have somewhat higher prices. Many models are available in the low hundreds of dollars, and some of you may decide that you need to own more than one, as they offer diverse looks and affordable pricing. There’s not a lot of collector interest in the brand just yet, as they’re relatively new and mostly powered by quartz movements. Collectors like mechanical models and older models, but in time, this could become quite a collectible brand, as these watches are certainly distinctive and stand out in a crowded field. You can find the brand for sale at a few selected retailers, which are generally jewelry stores and upscale department stores. You can also find them for sale on the Internet, as a number of retailers carry them there, and that will represent your best opportunity to buy at a discount. At a couple of retailers, we’ve seen them for sale for as much as 60% off the list price, so it will be worth your while to look online. The product line is large, so don’t expect any retailer to stock everything. Most of them, however, should have a good representative selection in stock, which will give you a good idea of what the entire product line is like. If you like adventurous, edgy styling, with oversized cases and bright colors, you’ll love this brand. They’re not for the timid, and you’ll be hard-pressed to find anything in their product line with traditional styling. Many of the chronograph models resemble those from other brands, but there’s nothing old school about the looks. They’re designed to grab attention, and they’ll certainly do that. They’re well made, and come with a decent warranty and they’re also affordably priced, and a few buyers are likely to want to buy more than one, as they’re all different enough to warrant having two or three in your collection. 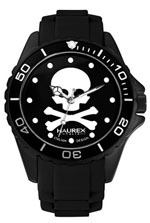 If you want something that’s truly different, you definitely want to give Haurex watches a good look. Rent a Designer Watch - Does It Make Sense For You?